A bizarre story links a purported “cult” leader from Wisconsin to an Orthodox Jewish school in Baltimore. 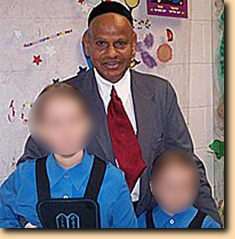 Affidavits filed in a Wisconsin court claim that R. C. Samanta Roy, formerly known as “Rama Behera,” is now using the name “Avraham Cohen” in Baltimore, Maryland reported the Shawano Leader. “Dr. Avraham Cohen” was pictured on the Web site of Yeshivat Rambam and identified as “a neurosurgeon” that has pledged a half million dollars to the institution. However, according to an affidavit filed in a Wisconsin lawsuit the man in the photo is actually R.C. Samanta Roy. “I have known him for some time and recognize him in the picture,” states a member of the Shawano city commission in the affidavit. The story about the doctor published within the Yeshivat Rambam’s newsletter does seem just a bit incredible. Maybe Roy beleives because he “says so” he is a member of a religious group and “that’s it”? And not only is he “Jewish,” he is also a doctor, a “neurosurgeon” no less. Former members also cite Roy’s “lack of consistency,” which perhaps explains the contradiction of a man that once led a group known as “The Disciples of the Lord Jesus,” claiming that he is an Orthodox Jew. “Now I belong to a Jewish school and a Jewish community, Yeshivat Rambam,” he is quoted as saying, adding the school’s teaching stems from the Torah. Former members have also said that Roy encouraged them to take “Jewish names,” perhaps his own adoption of the name “Cohen” is somehow part of that idiosyncratic practice. Interestingly, after a photograph of “Cohen” was posted on the Ross Institute Web site subsection about Rama Behera protests were launched by both Roy’s attorney in Wisconsin and Yeshivat Rambam of Baltimore. The Baltimore school claimed the photo was its property and could not be run without explicit permission, but subsequently provided no proof of intellectual property rights or copyright. CultNews now runs the photo of both “Rama Behera,” also known as R. C. Samanta Roy, along with the one taken of “Dr. Cohen” with his two “daughters” in Baltimore. Let readers judge if these photographs are of the same man. But CultNews thinks they sure look like the same guy. Note: CultNews is now accepting submissions to be published. If you are interested please make your submission of 400 words or less and about a related subject of interest (e.g. note the many categories to the right). A shocking and well-written article. One wonders what the members of this Yeshiva community would think if they knew of all this. Cheers, and keep up the great work !